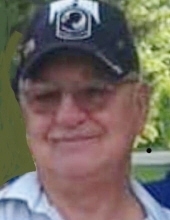 Maysville – Danny Thomas McMahan, 74, passed away with his family at his bedside, Saturday March 30, 2019 at his residence. Dan served his country honorably in the Army in Korea and retired from Pics Produce in Cincinnati as a delivery truck driver. He was born October 17, 1944 in Cheviot, OH to the late Arthur and Laura Nics. Dan is survived by his wife Dorothy Couch McMahan, daughters Carrie McMahan and son-in-law Todd Hutchison, Michelle Ayerakwa, Christine McMahan, son-n-law Donald Jackson, grandchildren Megan McMahan Financeé David Arnold, Tyler McMahan, Zariah McMahan, Perrion Nichting, great grandchildren Brentley McMahan, David Arnold, Jr. and a sister Janet Frazita. Besides his parents Dan was predeceased by his brothers Tommy, Jerry, Arthur, Bobby and sisters Lavearn Catenzaro and June McMahan. Memorial Service for Mr. McMahan will be 2 p.m. Sunday April 7, 2019 at Brell & Son Funeral Home. Calling Hours will be from Noon until the time of service. To send flowers or a remembrance gift to the family of Danny Thomas McMahan, please visit our Tribute Store. "Email Address" would like to share the life celebration of Danny Thomas McMahan. Click on the "link" to go to share a favorite memory or leave a condolence message for the family.